Lower right, on masonry: "Jan Victors FC 1649"
After curing Tobit's blindness, returning the family's wealth, and making it possible for Tobit's son Tobias to marry his beloved Sarah, the Archangel Raphael has dropped his disguise and revealed himself as an angel, saying, "I was not acting on my own will, but by the will of God." Such a scene of miraculous intervention was especially attractive to Protestants in Holland, who believed in doctrines of faith, mercy, and divine grace. 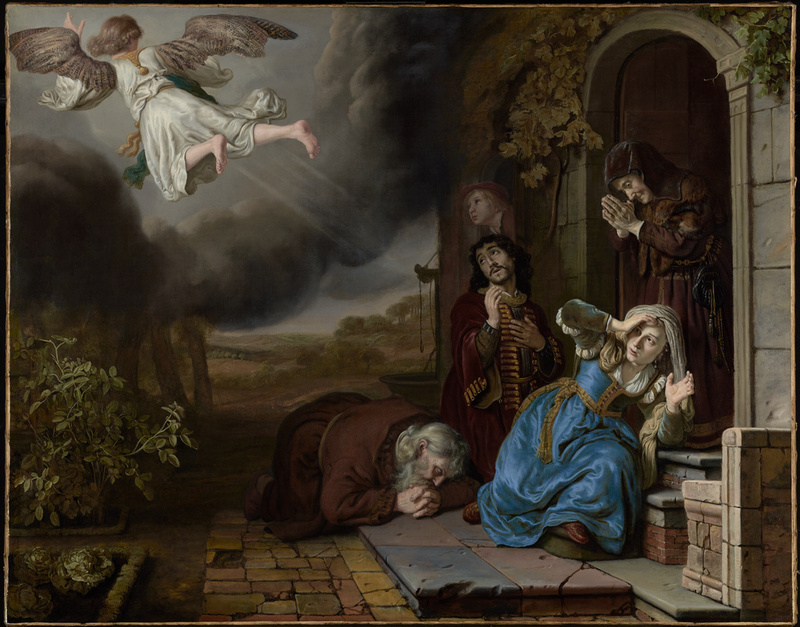 Jan Victors took his subject from the Book of Tobit, among the Apocrypha in the Old Testament. Borrowing elements from his teacher Rembrandt van Rijn's 1637 rendition of the subject, Victors set his figures before and within an architectural setting and opened the composition to a clouded landscape on one side. Strong contrasts of light and dark and a foreshortened angel, flying away on a diagonal and viewed from the back, give the scene animation and urgency. Victors's characteristically careful interpretation of surface details includes beautifully rendered highlights on the costumes and Tobias's head. Victor D. Spark, American, 1898 - 1991 (New York, New York), sold to the J. Paul Getty Museum, 1972. Source: Lender to Montreal/Toronto exhibition (1969). Hendriksz., et al., Amsterdam. Catalogus van fraaye schilderyen, door Nederlandsche schilders [...]. October 31, 1774, p. 5, lot 12. Valentiner, W. R. Rembrandt and His Pupils, exh. cat. (Raleigh: North Carolina Museum of Art, 1956), p. 123, no. 79, fig. 79. Judson, J. Richard, et al. Rembrandt after Three Hundred Years: An Exhibition of Rembrandt and His Followers, exh. cat. (Chicago: Art Institute of Chicago, 1969), pp. 86, 134, no. 92, ill.
Baroque Masters from the J. Paul Getty Museum, exh. cat. (Northridge: California State University, 1973), pp. 28-29, no. 36, ill.
Fredericksen, Burton B., ed. The J. Paul Getty Museum: Greek and Roman Antiquities, Western European Paintings, French Decorative Arts of the Eighteenth Century (Malibu: J. Paul Getty Museum, 1975), p. 114, ill.
Zafran, Eric. "Jan Victors and the Bible." Israel Museum News 12 (1977), p. 114, fig. 24. Linnik, Irina. Gollandskaia zhivopis XVII veka I problemy atributsii Kartin (Leningrad: Iskusstvo, 1980), p. 126, fig. 157. Foucart, Jacques. Les peintures de Rembrandt au Louvre (Paris: Editions de la Réunion des musées, 1982), p. 40, ill.
Blankert, Albert, et al. The Impact of a Genius: Rembrandt, Pupils and Followers in the Seventeenth Century, exh. cat. (Amsterdam: K. & V. Waterman, 1983), pp. 27, 29, fig. 22. Sumowski, Werner. Gemälde der Rembrandt-Schüler. 6 vols. (Landau, Germany: Edition PVA, 1983), p. 2601, no. 1742, fig. 1742. Miller, Debra. "Jan Victors (1619-1676)." Ph.D. diss. (University of Delaware, 1985), pp. 66-67, 276, 310, no. A85, ill.
Berry, J. Duncan. "Imagination into Image: On Visual Literacy." In Children of Mercury: The Education of Artists in the Sixteenth and Seventeenth Centuries, exh. cat. (Providence: Bell Gallery, List Art Center, 1984), p. 79, fig. 59. Manuth, Volker. "Ikonographische Studien zu den Historien des Alten Testaments bei Rembrandt und Seiner Frühen Amsterdamer Schule." Ph.D. diss (Freie Universität Berlin, 1987), pp. 43, 59, 186-87, no. 61. Bruyn, Josua, et al. A Corpus of Rembrandt Paintings. 5 vols. (Dordrecht: Martinus Nijhoff Publishers, 1982-2015), vol. 3 (1989), p. 239. Miller, Debra. "The Word of Calvin in the Art of Jan Victors." Konsthistorisk tidskrift 61, no. 3 (September 1992), p. 105n8, fig. 7. Jaffé, David. Summary Catalogue of European Paintings in the J. Paul Getty Museum (Los Angeles: J. Paul Getty Museum, 1997), p. 131, ill.
Kuretsky, Susan Donahue. "Rembrandt at the Threshold." In Rembrandt, Rubens, and the Art of their Time: Recent Perspectives. Roland E. Fleischer and Susan Clare Scott, eds. (University Park: The Pennsylvania State University, 1997), pp. 67, 96, fig. 3-16.